This workshop is targeted for those aspiring to understand and work with Photoshop, improving their skills in painting, sketching and more, as used in animation, motion picture or television production. 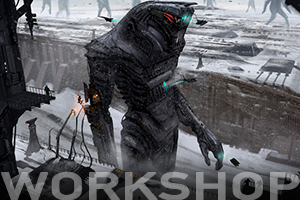 Topics covered will include, but not be limited to: digital painting, composition, lighting, perspective, custom brush creation, photo manipulation, character design, creature design, environment design, anatomy, and final presentation of artwork. Prerequisite: Basic to intermediate understanding of Photoshop, familiarity with Wacom tablets (for painting & sketching) strongly recommended.